What is Product Experience Management? Your brand needs a reliable way to continuously deliver the engaging product experiences that consumers demand across every relevant channel to drive market share and grow margins. This ebook will prepare you for the transformation needed to grow your sales, protect brand loyalty and drive internal efficiency in the rapidly evolving digital marketplace. The rise of digital technology has shifted more power into the hands of shoppers. There’s no longer a captive audience satisfied with a limited set of products on a physical shelf. Now, audiences increasingly crave niche products that are personally relevant to them. They shop along a long tail of products and you must respond with a virtually unlimited assortment. Product R&D Cycles Must Shorten: Amazon can launch a new brand and a new product in 2 months from a cold start, and thousands of Chinese 3Ps can do the same. Marketing Must Speak to Individuals: TV, radio, or newspaper ads are skipped by the youngest generations of shoppers. Mass media does not have the impact it once had on any audience. Sales Relationships Have Changed: The retail buyers your salesforce knew are being replaced by an algorithm that acts as assortment gatekeepers. Your top retailers want to list 100% of products online. Sales is tasked with knowing each retailers’ requirements and communicating them effectively enough so that your brand to deliver the right product content each digital endpoint. The Best Experience Will Win Future Sales. Shoppers expect personalized, convenient shopping, and seamless product pick up or delivery. Your brand is called on to be responsive without knowing where or when a shopper might request information. A single digital touchpoint can make or break your brand’s opportunity for consideration, purchase, or endorsement. Successful brands surpass these expectations to delight consumers with the most relevant and compelling product experiences throughout every shopper’s journey. That is the most productive way you will earn your margins and drive market share in this challenging new commerce environment. Global brand manufacturers are losing market share and suffering margin erosion. In the last two years, the top 20 consumer packaged goods companies have seen flat sales growth, with many brand giants cutting brand portfolios and overhead costs and staffing. THIS SLOWDOWN FOLLOWS A $18 BILLION LOSS IN MARKET SHARE FOR TOP BRANDS TO CRAFT AND PRIVATE LABEL MANUFACTURERS, IN THE PERIOD FROM 2011-2016. On the physical shelf, being recognized more than your competition is what mattered. On the digital shelf the bar is recall not simply recognition, which is a higher bar. The reason is that consumers must actually recall your brand to search for it. If a consumer cannot remember - and spell! - your brand name to type it into the search bar, he or she will search using generic keywords. Your brand is then in competition against the hundreds of other brands in that category. For example, only 36% of Amazon’s top 100 keywords are branded or trademarked terms. Consumers are willing to pay a premium for the most beloved brands. But that loyalty and trust has become harder to earn on the digital shelf. Every SKU is judged by criteria the shopper sets. Consumers judge value and quality on a case- by-case basis according to their personal criteria. A Clear M&C Saatchi survey found 86% of U.S. consumers seek out brands based on their attributes rather than their status — regardless of category. Failing a digital transformation is an existential threat to your brand. Yet, it may be hard to justify investing in digital at a high, strategic level. Ecommerce is still only around 10% of all retail sales today. Your biggest challenge may be how to maintain operational excellence in your existing old world structure while also investing in entirely new competencies and content required to market and sell products online. Upstart and digital-first brands often have the flexibility and lack of historic overhead to move quickly in the digital world and grab market share online. Regardless of company size or SKU count, there’s ongoing opportunity to win or lose market share in your category. Previously, brand marketing’s goal was to reach as many people as possible with a ‘good for everybody’ campaign. Now, brand marketers must tell a compelling brand story at all the various digital touchpoints in a shopper’s journey. This will require a new level of insight and data segmentation on your consumers, as well as the means to reach them at the right time. Every successful experience you orchestrate helps maintain your advantage. Deliver the right content, when and where consumers need it, and you will drive purchases and build trust. It starts with compelling product content that is continually optimized for success using data-driven insights. Then, that content is delivered rapidly throughout the commerce ecosystem to create the relevant experiences consumers demand. Finally, the experiences must be continually measured with actionable insights and re-optimized as the digital landscape changes. Leadership Moves From its Ecommerce Corner to a Cross Functional Force: A Chief Digital Officer, or the leader responsible for ecommerce revenue, must have the appropriate span of control to truly coordinate across multiple departments - including influence over areas not typically thought of as “ecommerce” such as finance and logistics - and orchestrate long-term progress towards digital transformation. Sales Adopts a Merchandiser's Mindset: A salesforce can no longer rely on individual relationships with retail buyers. Even traditional retailers like Walmart and Kroger are leaning increasingly on algorithms to determine which products to carry in-store. Sales teams must embrace the quant nature of ecommerce sales. Marketing Drives Demand from Customers and at Wholesales, Retailer, or Distributor Channels: Eliminate the traditional tactical silos of brand vs. trade marketing. The role of a marketer in the digital age is to leverage the strengths of your brand and data from your sales channels to customize messages that speak to each relevant target audience. Logistics Builds New Competitive Differentiators: Product availability is critical to a successful ecommerce footprint. Look beyond treating logistics as a cost center and reconfigure your team for same-day dropshipping, and other innovations in order to sustain competitive advantage. Legal & Compliance Enables Faster Oversight and Approval: Meeting the regulatory and compliance requirements is a must and it can’t be a roadblock to speed. Coordinate with legal compliance teams to protect against risks without sacrificing time-to-market with early or incremental approval processes. It Powers Organizational Efficiency While Upholding Data Standards: Traditionally, IT is burdened with safeguarding product data as static resource and may wind up trapped in a frustrating gatekeeper relationship with go-to-market teams. Build partnerships with sales, marketing and product teams by using flexible integration tools to meet your team’s needs and the organization’s data security needs. Tools and Technology: What Are your PXM Platform Requirements? Even the right team can struggle to deliver on the promise of PXM if it is not supported by the right tools and technology. Above all, the PXM technology platform must enable speed and agility. The retail space today is fiercely competitive and rapidly innovating, rendering older tools and technology approaches ineffective on a continual basis. What it is: An ecosystem that connects to each of your digital endpoints, updates with every endpoint’s requirements, and transforms your content to meet them so you can ensure consumers get the optimal product experience. Why you need it: Full spectrum product content is the key underlying enabler for creating the right product experiences for every consumer in every digital context. Does the system offer true flexibility and agility for business users? Can business users to add and integrate any new data from any source, including new attributes, without delay, allowing them to respond to new opportunities or requirements in the ecosystem? Does the system offer a flexible but effective approach to data governance? Can the system evaluate the quality and completeness of your catalogs, but without imposing conformance delays on business users adding new data? Does the system offer powerful search capabilities across both data and metadata (such as completeness, update history, publication status etc.) allowing business users to identify high priority opportunities to improve the data behind key product experiences? What it is: A central, high-quality source of truth for all product information, spanning core logistical and pricing data, to marketing copy, to digital assets and rich media. Why you need it: PIM and MDM systems merely manage data and don’t support the activation of your product content everywhere that consumers shop or experience your brand. Can it connect to your entire retailer network, internal data systems, and external technology partners? Does the system help you assess the readiness of your data with respect to unique requirements of key retailers such as Amazon and Walmart? 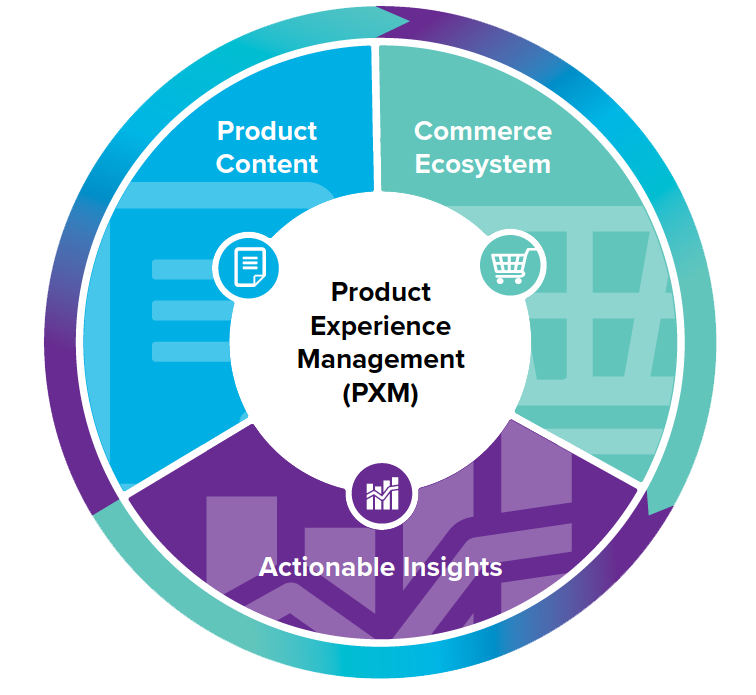 Can the PXM platform publish to any and every target system that you care about, from the major retailers, to long tail retailers, to your direct to consumer site, as well as your custom sales enablement portal, and everything in between? Does the publication experience support the business user in optimizing the content for every single publication channel, as opposed to repurposing generic content across all or most channels? What it is: The ability to apply AI and machine insights to your product, sales channel, and consumer data in real-time and translate those key insights into action tasks for your team to use to improve performance fast. Why you need it: The decision for where to apply the next round of effort to improve product experiences is complex and needs the guidance of data and analytics from across the consumer product experience journey. Does the platform have the flexibility to deliver any relevant data signal from your digital shelf ecosystem, across every product, channel, and consumer segment? For example, can it report on brand compliance and provide inventory and pricing data in real time? Does the platform provide advanced analytics that predict product experience success or failure with AI and machine learning? For example, beyond simply looking a search performance, can the system recommend specific keywords that would make a difference? Does the platform allow insights to be translated into actions? Does the system support the automatic translation of the most important data insights into simple, direct workflow actions for the right team member or group? What it is: A workflow system that captures and manages disparate activities, from sensing analytic signals and determining response to taking the appropriate action both internally and with appropriate ecosystem interactions. Why you need it: The bulk of the work in ecommerce is a myriad of ad hoc, one-off tasks done in reaction to changes in your consumer, sales channel, or product. You need one system that supports standard, repeatable processes as well as the complex, unpredictable tasks without slowing you down. The bulk of the work in ecommerce is a myriad of ad hoc, one-off tasks done in reaction to changes in your consumer, sales channel, or product. You need one system that supports standard, repeatable processes as well as the complex, unpredictable tasks without slowing you down. Is it flexible and extensible enough to be easily customized to represent new types of tasks and workflows that are specific to your organization? Your PXM platform will sit at the center of a wide variety of systems, from data sources such as ERP, PLM, logistics systems, and others, to activation systems like your direct-to-consumer site, retailers, marketplaces, ratings and reviews systems, and more. For a PXM platform to work effectively and efficiently, it must offer powerful and flexible integration capabilities, such as clean APIs, event notifications to quickly track data changes, and clean support for a variety of data types and formats. Tackling digital transformation at your organization will require investment and focus on people, processes, and technology that can support product experience management. But you can’t dismantle the old immediately. And you can’t execute it all at once. Master Basic Content Execution: Manage your product listings across the retailers you sell today. Make sure product content is accurate and complete. Adopt a process to refresh, update and measure product content across every SKU. Monitor Forward-looking KPIs: For example, you need to track where and when products are out of stock on each retailer, whether you have an effective product assortment, and how efficient your item set-up or content refresh process is today. Adapt R&D and Logistics Accordingly: What do you need to change about your product, assortment and logistics based on what you’ve learned?